Welcome to Jalopnik Movie Club, where we take a look at cars in movies and movies about cars, and you write in with all of your hot takes. 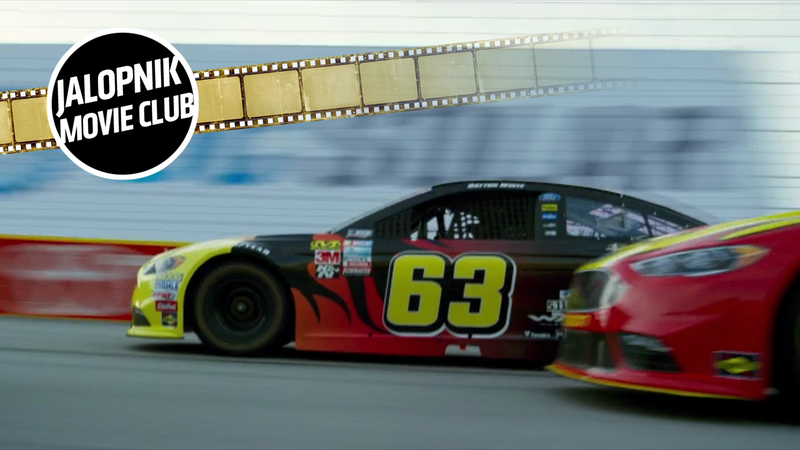 This week, we’re reviewing last year’s Logan Lucky, a heist movie full of good cars and centered around a NASCAR race that doesn’t feature a single dang car chase. Logan Lucky, the wacky story of two unlucky West Virginia brothers fighting a supposed family curse by rounding up a bunch of southern caricatures to rob Charlotte Motor Speedway, hails from director Steven Soderbergh, who’s known to make a good heist movie or three. But where his Ocean’s franchise—which I promise to finally stop bringing up for awhile after this review—was sleek and witty and focused on cool, higher class conmen, Logan Lucky focuses on backwoods common criminals. I was initially very excited following the trailer for this movie. A good director out of early retirement back in the heist genre and working with top level acting talent on a movie focused on Charlotte Motor Speedway, which was literally 11 miles down the road from me at the time it was released? It sounded like a perfect movie, so of course I paid the admission price and had to go see it opening weekend. Unfortunately, not many other people followed me into the theater. The movie barely made its budget back, even after global release. I was curious if rewatching the movie for this review would change my mind on some of the hangups I had with my initial viewing. It didn’t. I felt before, and still feel, that the filmmakers couldn’t help but mock the culture of the characters they created, at least in the first act. In the same way the movie makes a British caricature out of Seth McFarlane’s greasy NASCAR sponsor character, the West Virginian southerners depicted in this movie feel exaggerated to the point of mockery. I grew up going to the Lee County fair in North Carolina, and we don’t have toddlers racing lawn mowers and pig’s feet bobbing contests. The people don’t refer to computer science as “knowing all of the Twitters.” If the movie was just trying to be light in the beginning, it didn’t get it right. Once we get involved in the motions of the Logans’ plan to break Joe Bang—brilliantly cast and portrayed by Daniel Craig—out of prison to help them bust the cash vault at Charlotte Motor Speedway, the movie can easily be forgiven. It’s like the filmmakers tried too hard at the start to mislead the audience into thinking these southerners were really that dumb as way of planting in the shock of them successfully ultimately pulling off such a complicated heist. It wasn’t necessary. The one and only thing I love about this movie is the heart it finds in the final act. The scene where Channing Tatum’s Jimmy Logan makes it just in time to see his daughter sing his favorite song, John Denver’s Take Me Home, Country Roads, gets me in the feels every time. The rest of the movie feels disjointed. It’s not quite up to speed with most of Soderbergh’s other work in my eyes. Even when we’re deep in the heist with simultaneous prison riots during a NASCAR race, the energy of the movie never quite livens up. It always feels just slightly off kilter and unbalanced to me, like it’s constantly switching between parody and sincerity. The Logan sister’s Chevy Nova is nice, and so is the Mustang GT350 she borrows, and the Americana clips of the NASCAR race almost get to something, but overall Logan Lucky just feels like it lacks a bit of punch or misses a punchline in the end. Logan Lucky. What a baaaaaaaaad movie. I felt like it was originally made for Fox Sports 1 to air between NASCAR prerace and what ever vomiting noises come out of Skip Shannon and Colin Cowherd. I watched the whole thing, but I’m not sure that they didn’t have a car jump freeze frame with a narrator saying, “Whelp it appears that them knock-off Duke boys have got themselves into a pickle again.” Oh yeah that’s right, there wasn’t even a car chase in the movie, just a snarl from a GT350. I work with a guy from that part of West Virginia who swears up and down that it was the funniest dang thing that’s come out in a while. I think that I might have chuckled once. Anyways, don’t watch this movie. As a geography nerd, it pains me that so much of Logan Lucky relies on Channing Tatum’s character crossing the NC/West Virginia border: to go to work, to do the heist, etc. There is no border between West Virginia and North Carolina. Virginia is in the way. To drive from even the southernmost tip of WV to Charlotte would take about 4 hours. Also, as a rather formulaic heist movie (but with a good-enough Ocean’s Eleven-style twist on the end), the NASCAR tie-in seemed almost entirely unnecessary. Telling a story about West Virginians puling off a heist in coal country would have worked on its own. The Charlotte Motor Speedway is, to me (North Carolinian who recently moved out of state), so tied to North Carolina that it obscured the message of “Hey, West Virginians can be proud of their state too”. I think Martinsville is closer to West Virginia anyway. This isn’t a car movie. The NASCAR scenes are tacked-on, Sebastian Stan was wasted in a role that didn’t have any relevance to the plot and wasn’t funny. Also, speaking as a lifelong fan, this movie made NASCAR look ridiculous, and not in the fun, in-on-the-joke way like Talladega Nights. They never explain that the race is on Memorial Day, so all the random patriotism (SUPPORT OUR TROOPS written on the tires, the names of servicemen and women above the windshields, etc) isn’t explained. The line “NASCAR is like America” made me want to throw up. Logan Lucky this time around, eh? Lemme tell you, when I heard the words “NASCAR heist flick” combined, I felt like there was no way they couldn’t make it a winner; that’s 200% up my alley. When I went to go see it in the theater with my family (and I don’t usually bother with seeing movies in the theater), I will say it wasn’t at all what I expected, and that wasn’t necessarily bad! The first half is very nicely paced, moving along briskly and definitely leaning nicely on comedy to propel it. The use of Charlotte Motor Speedway as not only the target, but pretty much outright an antagonist, was pretty excellent, and they did a great job of nailing the race-day experience when it kicks off. (All the more impressive considering not all of those shots were at Charlotte; many of the interior shots are recognizable locations throughout Atlanta Motor Speedway instead). So, to me, it had two obvious questions to answer; how much does it matter that it’s NASCAR, and how well does it work as a heist flick? For the most part, it feels like North Carolina overall is used excellently as a setting, not just Charlotte. The main cast is generally charming and interesting and nearly everybody has a role to play in the heist itself, so it comes together well. I ended up with a whole lot more respect for Daniel Craig (playing against type for once) and Adam Driver (having only seen him in Girls and Episode VII up to that point, it was a joyous “he really can act!” moment), and the actual heist felt very satisfying to see play out (especially the second time). However, the pacing does kind of fall apart in the second half; it tries to close out a whole lot of character motivations, but lingers far more sluggishly than the film up to that point. I felt like it could’ve afforded to have a good bit more cut out of it. Seth McFarlane’s character especially; there didn’t seem to be a point to his presence at all beyond the very first scene he appears in, and the extremely bad British accent takes away from the more earnest performances from everyone else. As far as a NASCAR movie goes... well, it feels weirdly like there was an “Ocean’s Seven-Eleven” type deal already in the works and then this was combined with it. The forced and prominent inclusion of Charlotte posters and such makes it feel occasionally tacked on, but for the most part, it still works. It was amusing to see the Sprint Cup logos everywhere, up until the point where an energy drink sponsor is shown to be caustic and awful and harmful to one’s health, at which point it became hilarious. The actual driver cameos were absolutely excellent, too; nearly every bit part is someone from the Cup roster, and if you’re a fan, it keeps you paying attention and smiling every time they appear. Carl Edwards and Kyle Busch absolutely steal the show as a good cop, bad cop duo (in the exact opposite roles they’re known for). Imagining this whole labyrinthian complex beneath Charlotte has some truly undeniable cool factor. All in all, though, considering the sluggish pacing towards the end, I’d say while I totally had fun with it, I’d somewhat easily recommend it to NASCAR fans interested by the premise, but hesitate far more to recommend it to people that just like this kind of movie or just like racing. It wasn’t as good as it could be but it’s definitely a fun time; I’d suggest it as a casual Saturday morning watch. If nothing else, the lovably, purposefully, absolutely excruciating national anthem performance is completely spot-on. I loved the Ocean’s movies! While the sequels just gave diminishing returns I still really enjoyed them. I was pumped when I heard Steven Soderbergh was back! I love the cast of this movie. Daniel Craig is great! I like actors that don’t take themselves so seriously and can do a fun movie once in a while. This movie has a lot of Nascar cameo’s. I enjoyed that it is very automotive heavy though there aren’t any car chases typical with a car movie. I used to live a few miles away from Charlotte motor speedway about ten years ago and it is always cool to see somewhere you have been in a movie. In this movie we see the following: A man cooking breakfast, a woman dressing hair, and a girl singing a song. Following the theme of heist movies the first contemporary film to be reviewed is pedestrian. Director Steven Soderbergh takes his Oceans format to the common man. Unfortunately it doesn’t quite transfer smoothly to the “Hill Billy Heist”. It mixes the slow building elements and clever schemes with low-brow humour. In this regard, the film comes off unnatural, like a vehicle on its spare donut. Case in point was Seth MacFarland as Drink Mogul pay to drive Max Chilblain. Personally, I could have done without that whole weird offshoot of the story that ventured to inject comedy and the attempt to greater bond NASCAR to the film. It arguably just edged Hilary Swanks acting as the greatest fumble. The films central points are the characters and the heist with the vehicles providing the necessities for the endeavor. It features essentially cameos of a variety of vehicles. The viewer is given the longest bursts to the NASCARS, a ’82 F150, ’73 Nova, and ’16 Shelby GT350. It’s actually rather disappointing that this secondary cast couldn’t be utilized further. I’ve ragged on Lucky Logan enough that I should mention some of the finer points. I did enjoy the characters that were developed and the acting of Channing Tatum, Adam Driver, and Daniel Craig was well done. The heist itself is endearing in a zany way. These do not cure the awkward stride that the film ambles through, however it does make it more enjoyable. Movie: With a mismatch comedy to scheme in terms of cleverness mixed with a slightly slow velocity, Lucky Logan earns a C+. Car Movie: The heist could have taken place at Disney World and it realistically wouldn’t have affected the plot beyond recognition. The quite wonderful cast of cars has such short moments on screen that it also receives a C+. A country heist movie with some parts familiar but entirely its own rollicking creation. There’s the heist itself. Soderbergh sets up the cast and characters in such a way that you wouldn’t believe this motley crew could pull it off. Half the time I was too distracted by Adam Driver’s accent given I had scenes of him swinging a three-bladed lightsaber in my head. A vital plotline of the film was that the Logan’s were an unlucky bunch, which is true, but only until the end do we realize just how smart the main character, Jimmy Logan is. The Logans weren’t so unlucky as they were waiting for the stars to align in a heist of epic proportions. I don’t know if Soderbergh set it up that way to appeal to an American audience, but it I think those elements of the movie will make it one of those underrated evergreen classics that should see decent residuals rolling in. I can’t be the only one to associate seeing Mellie Logan in jean shorts next to a muscle car and think Daisy Duke ala The Dukes of Hazzard. In the end, I was pleasantly surprised to see how two hours could fly by so fast, surprised enough to google up what other works Soderbergh has done to add to my “To Watch” list. In the meantime, sound off below about the good and bad of Logan Lucky and all of its serious coolness, and see you all next week!